EU campaigners have criticised the shadow foreign secretary after she suggested the government's Brexit deal could get her party's backing in a crunch vote later this year. Emily Thornberry said if ministers only put a "blah blah blah divorce" with no detail to the vote, it would "probably" pass Labour's tests. Labour MP Chuka Umunna accused her of joining "arm in arm" with Brexiteers. The party has already set out six tests it says the Brexit deal must satisfy. What are people saying about Brexit? These include protecting workers' rights, keeping the "exact same benefits" as membership of the EU single market and putting in place a "fair" migration system. Otherwise, Labour says it will not back the deal in the "meaningful" vote promised in the autumn - which could trigger a government defeat. Downing Street says this would mean the UK leaving the EU without a deal. The thrust of Emily Thornberry's criticism was clearly intended for the government; she claimed that whatever withdrawal deal was put before parliament in the autumn would be so meaningless, so "blah blah blah", that it wouldn't result in a meaningful vote. However, she also seemed to suggest that as a consequence it could pass Labour's six Brexit tests - and therefore win the party's support - a position that was later clarified. Whether the intended meaning of what she said differed from her language or not, her comments were enough to provoke a response from Remain supporters within her own party - and won't do anything to counter critics who've accused Labour of a lack of clarity over Brexit. Speaking at a Chatham House event in London, Ms Thornberry said there was no chance everything would have been negotiated by the time of the promised vote. "So the question then is what's the nature of the divorce," she said. "If past evidence of the last few months is anything to go on, it's going to be a 'blah blah blah' divorce." She predicted the government would "continue to kick things down the road", adding: "So the difficulty is going to be with the meaningful vote in October which we have secured, is that what is it that we are going to be agreeing on - so we have six tests, if you hold up blah blah blah to six tests it will probably pass it." She added that she hoped for a general election in the meantime to give her party the chance to take over. Mr Umunna, speaking on behalf of the Open Britain campaign, accused his fellow Labour MP of "blasé chat" about the most important issue facing the country, warning against Labour joining "arm in arm" with Brexiteers to support the final deal. "It is extraordinary and unacceptable that the shadow foreign secretary seems to be suggesting that some 'blah blah' from the government will be enough to secure Labour's support to write the government a blank cheque for Brexit," he added. 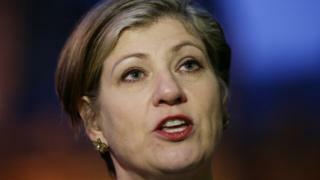 Ms Thornberry's spokesman later clarified her remarks, saying: "Emily made clear, as we have done for more than a year now, that the government needs to deliver a deal which meets our six tests, in particular by explaining how we will maintain current arrangements on the Northern Ireland border, and ensure all UK firms maintain the current benefits of access to the single market and customs union. "We await to see if we will get any substantive answers on those questions by the time of the planned vote in October."